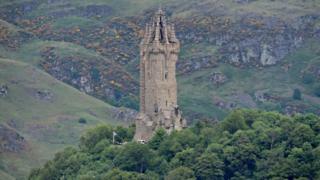 A drone smashed a window after crashing into the Wallace Monument in Stirling, it has emerged. The incident happened at about 16:30 on Saturday. No one was hurt. Police said they were attempting to trace the operator of the remote aircraft, who was within the grounds of the 67m (220ft) high monument at the time. Officers said the incident was an example of the risks of flying drones in crowded or built-up areas. Insp Cheryle Cowan said: "While the use of drones is becoming more popular for members of the public when filming and photographing scenic areas or places of interest, it is essential that they are utilised responsibly so as not to cause alarm or injury to other members of the public. "I would advise that drone operators familiarise themselves with all the appropriate legislation so as to ensure they adhere to existing aviation laws and regulations, and be aware of the areas in our community where drone activity may pose a particular sensitivity."